Books and Resources for website hosting, creation, and support. - Adams Web Co., Royal Palm Beach, Florida - Website Development, Website Management, and Technology Consulting services. Books & Resources Information and tools to help clients navigate the tech landscape. 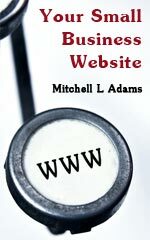 Your Small Business Website is a book by Mitchell Adams for Small Business owners who want to know the basics of getting a website started. Readers are given a general overview of concepts to consider as they form their small business website including ways to plan out your ideas and formulate an approach to getting their website built. The reader will learn the importance of registering for services themselves and other steps to take to protect their business interests and identity. While the book is not a technical guide (there is not an in depth discussion of code or specific applications), there are several concepts and terms the reader will find valuable when setting out to have a website built. Contact Us before choosing a hosting company as your specific needs and the quality of hosting may not match up. Some companies we work with are SiteGround, Microsoft Azure, Amazon Web Services, and on rare occasions GoDaddy. A good email provider is extremely important in order to keep your emails flowing and to stay off of blacklists. If you have low email traffic, the plan that comes with most shared hosting should be acceptable. For critical email needs, look into plans from providers like Rackspace, Microsoft, and Google. Contact Us to help you choose the right mix of marketing platforms to advertise your business. The more popular services out there include: MailChimp, Constant Contact, Google Adwords, Facebook Ads, SendGrid, Instagram Ads and affiliate programs. As one of the Directors of our foundation, I had very high expectations for the type of website I wanted to create. I was very pleased with the work done by Mitchell Adams. He worked very hard to create what I had envisioned for our foundation's website. Not only was Mitchell extremely knowledgeable and efficient in his work, but he also offered his suggestions and creative ideas time and time again throughout the process of adding numerous pages and features to our website. I was very impressed with the quality of work, customer care, and meticulous attention to detail. I will surely refer him to anyone who is looking for quality web designer!